We're calling on you to call Governor Cuomo and his regional representative in an effort to preserve the future of the FLX. 1.) Call Zachary King at 585-455-2073, Governor Cuomo's Regional Representative in Rochester today! Governor Andrew Cuomo has already stated publicly his opposition to the incinerator proposed for the former Seneca Army Depot in the Town of Romulus saying that the, “incinerator project is not consistent with my administration's goals for protecting our public health, our environment, and our thriving agriculture-based economy in the Finger Lakes.”. It is imperative that he sign this bill into law, protecting the Finger Lakes region from another dirty project that would bring nearly 3,000 additional tons of other people’s garbage into the region every day, spew toxic compounds into the air we breathe and the water we drink and emit nearly 1 million tons of CO2, a potent greenhouse gas, into the atmosphere yearly in the midst of a climate emergency. 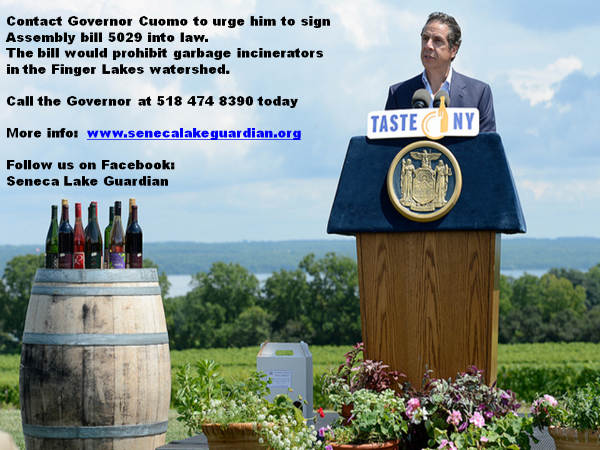 1) Toxic trash incinerators in the Finger Lakes threaten the region’s multi-billion-dollar Wine and Tourism industries. Call on @NYGovCuomo to sign the Finger Lakes Community Preservation Act of 2019 (A 5029A) and protect local businesses! 2) Trash incinerators are the most expensive and the dirtiest way to generate energy. The few jobs created will put a $3 billion wine and tourism industry that supports nearly 60,000 jobs at risk. Tell @NYGovCuomo to reject Circular enerG’s proposed incinerator in the Finger Lakes and to sign A5029A. 3) The proposed Finger Lakes anti-incinerator legislation provides @NYGovCuomo with a chance to stand by his word and protect our public health, our environment, and the thriving agriculture-based economy. 4) Over 30 local governments and school boards and over 500 local, environmental and business organizations have come out in opposition to the proposed trash incinerator. Urge @NYGovCuomo to sign the Finger Lakes Community Preservation Act of 2019 (A 5029A) now! 5) The town of Romulus thrives off its agricultural and tourism-centered economy. Circular enerG’s outrageous incinerator proposal would hurt thousands of jobs. Tell Governor @NYGovCuomo to reject this unsafe proposal and sign A5029A! 6) Dangerous trash incinerators are unnecessary and unsafe for the Romulus community. Urge @NYGovCuomo to sign the Finger Lakes Community Preservation Act of 2019 (A 5029A) so we can continue to protect and grow the Finger Lakes economy. 7) Trash incinerators are dangerous and pose health risks to Finger Lakes’ residents. Join local property and business owners to convince @NYGovCuomo to reject Circular enerG’s proposal for a toxic trash incinerator in the Finger Lakes and to sign A5029A. 1) The Finger Lakes has been Wine Country for over 150 years and is responsible today for over 75% of all the wine produced in New York. The wine, craft beverage, agriculture, and agri-tourism industry are driving job creation and economic growth in the Finger Lakes, which is home to hundreds of family vineyards and wineries, generates billions of dollars in economic activity and supports 60,000 jobs in the Finger Lakes alone. Tell @GovernorAndrewCuomo to deny Circular enerG’s proposal to build a toxic trash incinerator in the Finger Lakes! 2) Trash incinerators are the most expensive and the dirtiest way to generate energy. The proposed facility would burn 2,640 tons of garbage and withdraw 445,000 gallons of water from Seneca Lake every day and bring 238 trucks through the region six days a week. The 260-foot smoke stack will emit dioxins, furans, lead, mercury, arsenic, chromium, particulates, hydrochloric acid, sulfur dioxide and nitrogen oxides. It’s emissions are not compatible with New York State’s renewable energy standards. Let @GovernorAndrewCuomo know that you do not support the proposed incinerator in the Finger Lakes watershed. 3) Last year, Governor Cuomo said that a proposed Finger Lakes “incinerator project is not consistent with my administration's goals for protecting our public health, our environment, and our thriving agriculture-based economy in the Finger Lakes.” Now that the legislation has passed the State Senate and State Assembly, it is time for @GovernorAndrewCuomo to put his words into action. Support the Finger Lakes Community Preservation Act of 2019 (A5029A)! 4) Over time, legislation to stop waste incinerators in the Finger Lakes have gained traction and support from various coalitions of environmental groups, businesses and local and regional government. The proposed incinerator would not only rapidly deteriorate the surrounding environment but would also threaten the growing winery and tourism industries. The constituents of Romulus and the entire Finger Lakes region deserve better than the looming impacts. 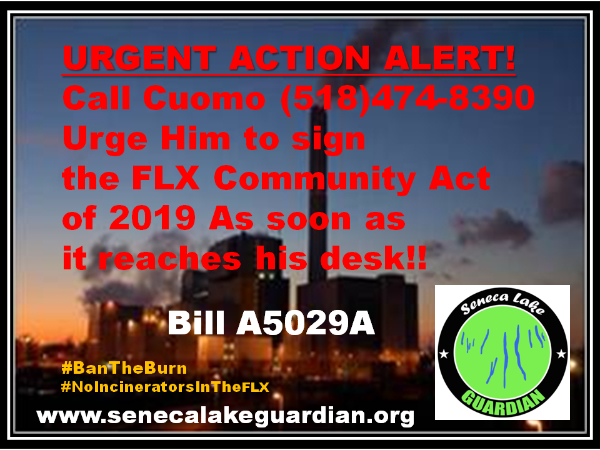 Call @GovernorAndrewCuomo to make stop Circular enerG’s waste incinerator with the passing of A5029A. 5) Circular enerG’s proposal to build one of the state’s largest waste incinerators at the former Seneca Army Depot in Romulus, New York puts upstate New York at a huge environmental and economic risk. Aside from the incinerator company itself, no organizations have opposed the legislation. We cannot risk damaging the pristine Finger Lakes environments and the future livelihoods of our neighbors. Urge @GovernorAndrewCuomo to sign A5029A now!